Ages 4 through 8. 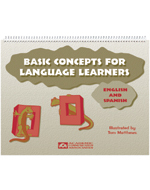 This book includes pictures and activities designed to help preschoolers and children in the primary grades understand and use basic classroom concepts such as on, in, under, behind, beside, in front, between, near, far, together, separated, inside, and outside. Sentences are presented in English and Spanish so that you can offer instruction in either language. Concept Contrasts. Pictures are presented for teaching concept contrasts such as inside/outside, front/in back, and on/under in English or Spanish. Each picture page includes an illustration depicting the two contrasting concepts. Both receptive and expressive language activities can be presented using the pictures. Concept Story. Students are asked to create a story by describing the action shown in pictures. A variety of basic concepts are represented in the story.